I was talking to one of my friends this week about how I use movies. They’re my therapy, my inspiration, my teaching tools and my allegory. I usually take solace in the super-duper when it comes to the big screen. I like epics and spaceships and guns a blazin’. I like high adventure, high seas, and high stakes. I think my heart beats “genre, genre, genre”. So it surprised me this week at around 11:00 p.m. on a Wednesday night when all of the sudden I felt this intense and sudden need to watch The Big Lebowski. Before Wednesday night, I’d only seen the movie once before and even that took some major effort on my husband’s part. I love the Coen Broethers, they’re masters of their craft. And they clearly love genre just as much as I do, likely much much more than I do. But due to a case of mistaken identity that would’ve been fit for Fred and Ginger, I avoided The Big Lebowski for years because I kept mistaking it for Kingpin,the gross-out Farrelly Brothers bowling romp. I think there are exactly two movies out there that revolve so closely around bowling imagery, so one can understand my confusion. 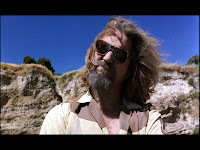 When Jake insisted that I watch The Big Lebowski a few months ago, I obliged and found myself promptly blown away. This movie is just one of a billion things that my husband has brought into my life that made it better, but I have to say, this one is pretty high up on my list. Maybe a part of me likes it so much because I know he likes it so much. The Dude's antics and Jake's hysterical laughter are one and the same to me. The two can't be separated, so I'm sure subliminally that has something to do with my sudden obsession. 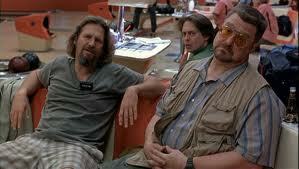 The Big Lebowski is weird. Like most Coen Bros. movies, one could argue successfully that it is a film noir, a comedy, a surreal mystery and an existentialist dream-like farce. It’s character driven, literary in its very nature, and yet utterly hilarious in the most simplistic of comedy terms. There’s slapstick and reaction humor and near-constant f-bombs. Bad language in movies usually makes me squirm, I’m kind of a girl scout that way. But in some movies, it just fades into the background and feels completely natural to me. I can’t explain the difference. I guess like anything else, when it's done well, you don't notice it. When it's done just to be obnoxious or antagonistic, it sticks out like a sore thumb. The same thing can be said of the drug references in this movie, which also usually set my eyes to rolling. But if anything, the bad language in Lebowski adds to the movie and the drug references add to the comedy, though I never thought I'd hear myself say that. It's not what's in a movie that makes it good or bad, it's how the content is used, written and directed. In this movie, everything is done so masterfully and with purpose that even the stodgiest of prudes can't deny that everything in the film adds to character development and comedic tone. It's a great example of the difference between cheap and easy references and a well-crafted story. So what exactly is the plot? How do I describe it to you if you’ve never seen it, if you’ve never seen a Coen Bros. genre smash celebration? Well, it’s a movie about a guy who would really like to get his rug back after it is defiled by thugs in a case of mistaken identity. This guy calls himself, “The Dude”. But he’ll accept “Duder” and any other variation of the word you can conjure. He leads a simple life. He’ll write a check for a carton of half and half. He wears jellies and wrinkled t-shirts and sweaters that probably need a good wash. He likes to bowl, he’s nice to strangers and he loves his friends, so much so that he puts up with them when they make things exponentially worse for him by interfering in his affairs almost constantly. The Dude is an egalitarian and he hates men who treat women like objects. The Dude wants to live and let live, sit in his apartment, drink white Russians and just exist. When I stayed up to watch it again, riveted all the way and trying to stifle my hysterical laughter so as not to wake my husband, I found myself completely and totally invested in the Coen Bros. complete picture of a gritty back-alley Los Angeles. I just wanted to climb into the screen and chill with The Dude. Because The Dude isn’t concerned with staying on top of his freelance work or climbing any kind of ladder or finishing his book or thinking about the ever-creeping-closer future full of student loan payments and bills and editing and paychecks. No, that would be me. I’m so stressed out right now that I might spontaneously combust. If I was a cat, I’d be shedding all over the furniture. So The Dude and his bizarre and simplistic world is so attractive to me right now that I can hardly stand it. I find myself with the nagging desire to go bowling and dress like a bum and redefine my idea about what it means to live a good life. I’m so attached to the movie right now, I’m even fighting the desire to go to the hairdresser and ask for the Maude Lebowski. I’m a drama queen, so I’ll probably feel much better in a few days. After I turn in the first draft of my thesis and hand out a fresh syllabus to my students and get going, I’ll probably go back to my same hyper-energized Mary Catherine Gallagher wannabe Lara Croft personality. 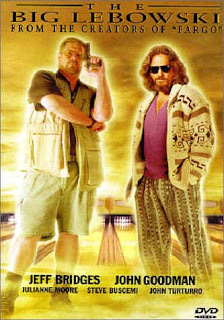 But until then, I think I’m going to watch a little Lebowski every night. I wanna see The Dude push Walter around after he gets ashes all over his face. I wanna see The Dude’s every subtle facial reaction while he takes in all of the weirdness that is Maude Lebowski and her ridiculous (but admirably individualistic and strong in her convictions) world of art and independence. Even the Dude’s dreams tell you everything you need to know about him. He likes bowling and beautiful women and that’s about it. And what's wrong with that?